Mrs. Baumgartner is a fun loving person who enjoys the outdoors. She has two wonderful boys who keep her busy with baseball, basketball and wrestling. She is excited to be teaching Kindergarten at Spring Brook School. One of her favorite parts of the day is getting smiles and hugs from her students. In her spare time, Mrs. Baumgartner enjoys reading, watching movies, cooking and baking. Mrs. Smith begin her teaching career at Spring Brook in 2007. She taught first grade for one year but has enjoyed being in Kindergarten​! Mrs. Smith received both her Bachelor's Degree in Early Childhood Education and Master's Degree in Curriculum and Instruction from Concordia University in River Forest, Illinois. She loves to sing and make her classroom come alive with children's laughter! She currently resides in Bolingbrook with her husband and two daughters. Mrs. Smith enjoys teaching and she is very grateful to work in a community with exceptional educators and supportive parents who promote and encourage each student to reach their fullest potential. Stuart Vance is a graduate of Central Washington University and a 26 year veteran of District 204. He received his Masters Degree in Curriculum and Instruction from Aurora University. Stuart has been part of the Spring Brook Staff since it opened in 1989. He has taught kindergarten, first, and second grade. In addition to his love of teaching and encouraging young, creative minds to grow and learn Stuart enjoys singing, acting, reading and his annual trip to Sanibel Island during Spring Break. District Mission Statement: Our mission is to prepare all students to succeed in an ever-changing world through comprehensive programs and experiences in collaboration with family and community. The reading readiness program also includes the integration of reading and writing. Each child begins at his/her own level and builds upon it. Students are encouraged to write their own stories to share with the class. A rich variety of children’s literature expands the students’ vocabulary and understanding and hopefully, builds a love of reading. Students are expected to be an active participant and will be called on whether or not they raise their hand. D’Nealian writing is a method of teaching numbers and letters. It makes the transition from printing to cursive much easier for the children. Cursive is taught in second grade. Children will be taught to write their name with a capital letter followed by lowercase letters (John, not JOHN). Reversals are common at the kindergarten level. Do not be concerned by this, as it tends to diminish as your child matures. Some of the topics in social studies include: famous Americans, the flag, our school, community helpers, and responsibilities and rules. Our science units include seeds to plants, seasons, water exploration, marvelous me, ecology, and magnets. Children are encouraged to express themselves through various forms of art activities. Students will have two 25 minute periods of art per week. Children will have two 25 minute periods per week in music class. Musical expression and rhythm are introduced. Students will have three 25 minute periods of P.E. Students will need to wear their athletic shoes. Plus there will be lots of exercises and activities in the classroom for students to stretch and exert their energy. At the kindergarten level, parents are encouraged to reinforce new concepts as they are introduced. Please go over your child’s papers each evening and talk about the concepts presented that day. Ask about the letter we’re learning and its sound. When D’Nealian letters are introduced, please encourage your child to practice the forms at home. This homework does not need to be returned to school. To increase vocabulary and build listening skills, we ask that you read to your child every day. Your child should be bringing books home from the school library on a regular basis. This is an excellent routine to start with your child. Reading to your child in a quiet, relaxed atmosphere will help him/her come to value the reading experience. You will also be working on developing your child’s attention span. During and after a story, check your child’s listening comprehension by asking some basic questions: who, what, where, when, and why. Above all, have fun reading. 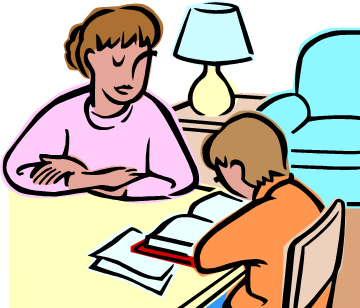 The last area of homework is personal care skills. If your child does not already know how to zip, button, and tie, please work on these skills at home. These skills are especially important in the cold weather months. Evaluation of each student is based on the teacher’s observations, daily classroom work, and report card checks each quarter. Kindergarten students do not bring home a report card for the first quarter, however, they will get a math progress checklist. Instead, at the November conference, we will discuss your child as a learner and how they have adjusted to kindergarten. During the second, third, and fourth quarters, report cards will be issued that evaluate specific kindergarten objectives. Good behavior is constantly rewarded during the day with verbal praise, high fives, hugs, and extra free choice time. Students will receive a green smiley on their calendar to indicate that they had a great day. Occasionally, students might lose some of their free choice time if they make poor choices. I will also be contacting parents as needed. Learning these behaviors is an ongoing process throughout the year. We learn that we all make mistakes and can learn from those mistakes. Parents can help by praising a good day. I appreciate your support as we work together to make this a successful year for your child. When we celebrate a student’s birthday, we sing to them, they wear a birthday crown, and they get to open a wrapped book from a classmate. Once a month, you will receive a newsletter explaining the current events and concepts that are being learned. Please read it to become acquainted with the subjects that will be introduced. I will be sending out emails to make other announcements. Please feel free to call me with questions or concerns you might have. Feel free to write a note or leave a message on my voice mail. Your call will be returned as soon as possible. Our kindergarten program will focus on the social, emotional, physical, and intellectual development of each child. Social development involves the child’s perception and acceptance of his/her social roles and responsibilities with regard to others. Social experiences will be provided on a daily basis which will require exploration of materials and environment, and problem solving situations. Experiences include: expression of ideas, cooperation, sharing, sense of belonging to a group, acceptance of responsibility, manners, active participation, respect for rules and authority, appropriate decision making, development of independent behaviors, and respect for the rights of others. Emotional development involves the child’s perception and acceptance of his/her self. Experiences will be provided to allow individuals to effectively react to the environment. Experiences include: development of positive self-concept, appropriate expression of needs, adaptation to change, appropriate response to guidance, and development of secure relationships. The program will include active physical experiences to enhance physical growth, coordination, and relief from stress. Experiences include: large motor activities, fine motor activities, and hand-eye coordination. Children will be actively involved in direct experiences which arouse curiosity and interest, as well as promote individual cognitive growth. The process rather than the product will be emphasized. Experiences include: math, reading readiness, language, science, social studies, and creative arts. Listed below are some questions which you could ask your child so that you will find out more about what happened during the school day. We hope you find these useful. Were you a helper today? Did you sort anything? What, and how? Did you graph anything? What were the choices? What story did your teacher read today? What happened? What did you do at free choice time? Who did you play with? What table do you sit at? Who sits next to/across from you? Did anyone have a birthday today? What letter are you studying? What are some words that start with that letter? What did you do in P.E., music, art, or computer lab?